Would you like to try your hand at making your own cocktail drink? What about creating an art masterpiece of your own? Starting right from the basics, the workshop aims to provide a glimpse of the world of bartending as well as guide you to creating your very own piece of artwork to bring home! All materials will be provided. Canvas & Mixes is a cross-collaboration between Uninhibited Space’s Artist-in-Residence, Jaxton Su (www.jaxtonsu.net), and The Coqteau Company (www.coqteau.com). 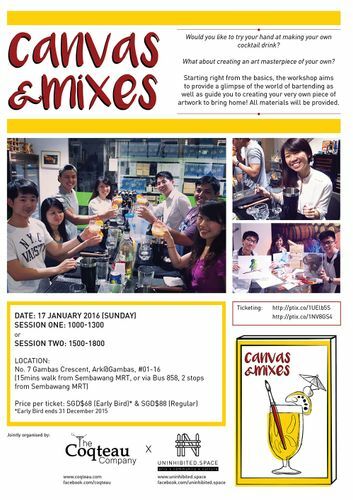 Canvas & Mixes sets itself apart from regular art jamming activities as it seeks to further enhance one’s experience of art-making through gleaning insights from bite-size art exploration activities before embarking on the actual piece. The 3 hour workshop consist of 2 components - Cocktail Making & Art Creation. What are you waiting for? Sign up at the links below!